So things are heating up with your significant other and you’re planning on popping the question – congratulations! While gearing up for your proposal is an exciting time, picking out the perfect engagement ring for your fiancé-to-be can be stressful, especially when you’re trying to keep it a secret. An engagement ring is typically a considerable expense, so it’s important that you take your time and do it right. Check out these helpful tips below to finding the perfect engagement ring that will have your partner saying “YES!” when you get down on one knee. Once you make the decision to propose, one of the first thoughts that probably comes to mind is how much you should spend on the ring. You have probably heard of the “two months salary rule” stating that you should spend two months of your income on an engagement ring. The truth is, there are no rules when it comes to how much you should spend on your partner’s ring. Budgets will vary by person and you must take your current income, expenses, and savings into consideration when setting your budget. You do not want to put yourself into a crazy amount of debt for the ring. It may be helpful to browse engagement ring styles online to see what type of ring you can get for your price range. Some couples go “shopping” for engagement rings together prior to getting engaged so you may already have an idea of what style ring your partner likes. If you’re unsure, don’t stress! There are plenty of ways you can find out what style best suits your partner while still keeping it a surprise. First, look through your significant other’s jewelry. Does she prefer diamonds or gemstones? Is she more into traditional metals like yellow gold or trendier metals such as rose gold? Second, enlist the help of her family and friends. Chances are she’s shared with her besties what style ring she likes. If your future spouse is on Pinterest, you can even try looking through her boards to see if she pinned her favorite styles! If you already know your partner’s ring size, great! If not, don’t fret. There are several things you can do to determine which size ring you should get. If your significant other wears rings often, you can bring one of them into the jeweler to determine its size. Your jeweler can then help you decide what size you should get based on the size of the ring that you brought in and what finger she typically wears the ring on. If you’re nervous about taking one of her rings to the jeweler, you can trace the inside of the ring as well. Keep in mind that the ring can always be resized after the fact if you don’t get it exactly right! 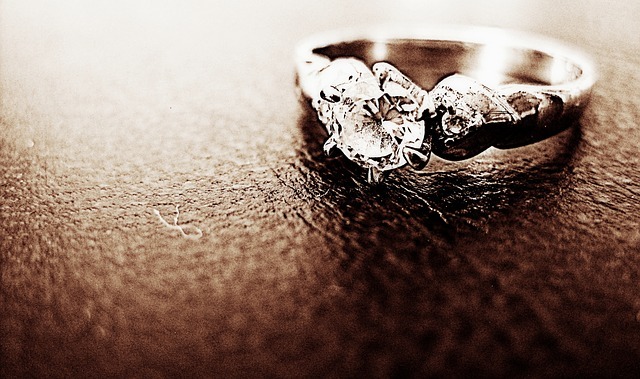 While some brides prefer picking out their own wedding band, others have no preference. In fact, it’s often easier to buy the engagement ring and wedding band together to ensure that they are the perfect match. When shopping for wedding bands, keep in mind that it should complement the engagement ring. For example, if the engagement ring is unique and intricate, you may want a more simple band. Whereas a simple engagement ring may call for a more sparkly wedding band to really bring out the stunning features of your partner’s engagement ring.